Recently I saw a video of a preacher railing at a group of sinners outside his church. He kept yelling at them, “You are going to Hell!” “You will burn forever in the flames of Hell!” I turned the video off and felt really sick within myself. There was not one word of kindness from the preacher, not one word of sorrow for the lost and confused people that he faced, not one mention of the love of Jesus for a lost world. “Woe unto you, scribes and Pharisees, hypocrites! for ye shut up the kingdom of heaven against men: for ye neither go in yourselves, neither suffer ye them that are entering to go in” (Matthew 23:13). “Woe unto you, scribes and Pharisees, hypocrites! for ye make clean the outside of the cup and of the platter, but within they are full of extortion and excess” (Matthew 23:25). “Woe unto you, scribes and Pharisees, hypocrites! for ye are like unto whited sepulchres, which indeed appear beautiful outward, but are within full of dead men's bones, and of all uncleanness” (Matthew 23:27). “Ye serpents, ye generation of vipers, how can ye escape the damnation of hell?” (Matthew 23:33). Yes, I think Christ would preach like that to the false preachers and false teachers of our day and of our time! But He never preached like that to the multitudes of sinners who came to hear Him. To them He was “a man of sorrows, and acquainted with grief.” He spoke softly to the woman at the well, though she had been married five times, and was living in adultery when He met her. He spoke softly to those who were diseased and dying, “and as many as touched [His garments] were made perfectly whole” (Matthew 14:36). To the woman taken in the very act of adultery He said softly, “Neither do I condemn thee: go, and sin no more” (John 8:11). To the thief on the cross beside Him, He said, “To day shalt thou be with me in paradise” (Luke 23:43). To the palsied man He said, “Son, be of good cheer; thy sins be forgiven thee” (Matthew 9:2). To the sinful woman who kissed His feet, He said, “Thy sins are forgiven” (Luke 7:48). Did Jesus ever laugh? He may have, but it is not recorded in the Bible. On the pages of Scripture we are told He was “a man of sorrows, and acquainted with grief” (Isaiah 53:3). And on the pages of Scripture we are told three times that He wept, and in our text we see that this was part of His personality – and an important part. It is difficult to imagine the passionless Buddha weeping – impossible to think of the impassive Roman gods, or the cold-blooded Allah of Islam, shedding tears. The tears of Jesus show us the compassion of His heart toward human suffering. Most of you know that I have great respect for Winston Churchill. But you may not know him as England knew him during the Second World War. 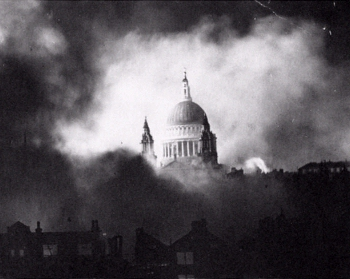 St. Paul’s Cathedral, London, during the bombing. You may only know his stern face from the iconic photograph by Yousuf Karsh. But in the long months that London was being gutted and burned by Hitler’s bombs, the English people often saw him in a different way. After a night of bombing, they would see him walking through the ruins of their homes with tears streaming down his cheeks. Churchill during the bombing of London. He stops outside a ruined shelter where forty adults and children had died the night before. A crowd gathers as Churchill wipes the tears from his eyes. The crowd shouts, “We thought you would come!” An old woman cries out, “You see, he really cares, he’s crying.” Then there is another cry from the crowd, “We can take it! You tell Hitler, we can take it!” Hitler might destroy their homes and their city with his bombs, but only by destroying their spirit could he defeat them. 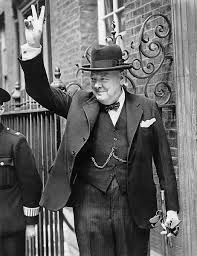 It has been said that Churchill’s tears for his people did more than anything else to overcome the power of the Nazi war machine. He wept when he saw people standing in line in the ruined street, waiting to buy seed for their canaries. He wept when he saw the bodies of dead and dying children in the rubble. He never wept out of fear, but always for the suffering of his countrymen. No, Churchill was not a Christian doctrinally. But he had learned to feel emotions like a Christian from his old Methodist nanny, Mrs. Everest. Her photograph hung near his bed till the day he died. Thus, he had the emotions of a Christian, more than any other leader I can think of in our time. It is impossible to imagine the Ayatollah Ali Khamenei, or Vladimir Putin, or Barack Obama crying out of compassion for the suffering of their people. Compassion is a Christian virtue – taught to the cold Roman world of the First Century by Jesus, “a man of sorrows, and acquainted with grief” (Isaiah 53:3). Three times we are told in Scripture that Jesus wept. I. First, Jesus weeps over the city. He came into Jerusalem one morning riding on a donkey. A great multitude of people followed Him crying out, “Hosanna to the Son of David: Blessed is he that cometh in the name of the Lord; Hosanna in the highest” (Matthew 21:9). 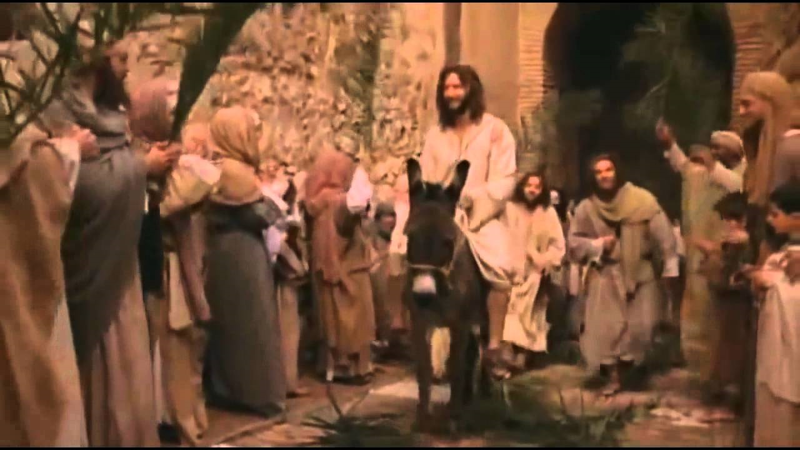 This is called the “Triumphal Entry” of Jesus on Palm Sunday. “And when he was come near, he beheld the city, and wept over it” (Luke 19:41). Dr. W. A. Criswell was one of the three greatest preachers I have ever heard. He was pastor of the First Baptist Church in Dallas, Texas for nearly sixty years. In one of his sermons, Dr. Criswell spoke of a preacher who had recently gone to pastor a church in a great city. “That is what I’m afraid of in me, in the church, in all the churches. We get used to it. People are lost – what of it? They have no hope – what of it? And finally we get used to it – and pass it by. In that we are different from Christ. ‘And when he was come near, he beheld the city, and wept over it.’” (W. A. Criswell, Ph.D., The Compassionate Christ, Crescendo Book Publications, 1976, p. 58). When Jesus stood on the Mount of Olives that day and looked over the city of Jerusalem, who would have thought that just forty years later it would be gone? Who would have thought that one generation later the legions of the Roman general Titus would hammer down the gates and the walls, and set fire to the temple of God? Nothing would be left but part of a stone wall that had surrounded the Holy Temple. “Your house is left unto you desolate.” And He cried. Jesus wept over the lost in the city. II. Second, Jesus weeps in sympathy. He told His Disciples, “Our friend Lazarus...is dead” (John 11:11, 14). He said, “I go to awaken him” – that is, to raise him from the dead. And so they went to Bethany, to the home of Lazarus. The pagans spoke of a “graveyard.” But Christians speak of a “cemetery” – which is a Greek word meaning a sleeping place, where we place our dead until Jesus comes to awaken them. That is what Jesus is going to do for Lazarus. But He waited four days to make the miracle show forth His deity and His power, so they would believe in Him. Now Jesus approaches the tomb of Lazarus. Mary, the sister of Lazarus, meets Jesus as He comes near. “When Jesus therefore saw her weeping, and the Jews also weeping which came with her, he groaned in the spirit, and was troubled” (John 11:33). In the original Greek it means that Jesus completely broke down, His chest heaving, wailing, snorting, gasping (ĕmbrimaŏmai) – deeply agitated, roiled like the sea in a storm, deeply disturbed, very troubled (tarassō). Have you ever felt like that when someone very close to you dies? I have. I have broken down and wailed, and gasped and heaved. I have been deeply disturbed, roiled like boiling water, deeply agitated. I have only felt that extreme pain and heaviness a few times in my life – but those were enough to make me understand what Jesus felt. I felt like that when my sweet grandmother, Mom Flowers, died. I felt like that when my life caved in at the liberal Southern Baptist seminary. I felt like that when my mother, Cecelia, died. It is not wrong. Jesus shows us, by His sorrow, that it is no sin for us to sometimes feel sorrow too. He was moved with strong compassion by the sorrow of Mary, and Martha, and the friends of Lazarus, who wept because he died. He shared the grief of Mary and Martha, because He also loved their brother Lazarus. And Jesus shares our griefs and sorrows too. I pity the young people of your generation. In too many churches they no longer sing the old hymns – the ones that touch the heart and comfort the soul. Kids today don’t know them, and thus cannot turn to them in times of trouble. But the old hymns are the ones that have carried my soul through the darkness. (“What a Friend We Have in Jesus” by Joseph Scriven, 1819-1886). The precious tears of Jesus. The compassion of Jesus. Thank God for the sympathy of Jesus. He whispered, “My precious child, I love you and will never leave you. Jesus weeps over our cities – lost, without hope. Jesus weeps with us in sympathy – when we go through times of sorrow. III. Third, Jesus weeps for us as He atones for our sins. “Who in the days of his flesh, when he had offered up prayers and supplications with strong crying and tears unto him that was able to save him from death, and was heard in that he feared” (Hebrews 5:7). What is the meaning of the agony in Gethsemane? When He suffered in agony so that in prayer His “sweat was as it were great drops of blood falling down to the ground” (Luke 22:44) ...The prophet Isaiah said, “God shall make his soul an offering for sin.” Isaiah said, “God shall see the travail of his soul and shall be satisfied.” Somehow, in a mystery into which we cannot enter, God made Him to be sin for us. And in bearing the weight and burden of all the sins of the world, He cried with strong crying and tears, “Father, if it be possible, let this cup pass from me.” (ibid., p. 60). Jesus cried with heavy tears, for God to spare His life in Gethsemane, so He could live to take our sins in His body to the Cross the next morning. And on the Cross He cried, “It is finished” (John 19:30) – and He bowed His head and died. With strong crying and tears, He was nailed to the Cross to pay the full penalty for our sins. That He might save us from endless loss. Blind and unheeding – dying for me! I am asking you to trust Jesus, who shed many tears, and poured out His Blood on the Cross to save you from sin and Judgment. He is now in Heaven, at the right hand of God. Come with simple faith and trust Him. His precious Blood will cleanse you from all sin – and give to you eternal life. Amen. Dr. Chan, please lead us in prayer. If this sermon blessed you Dr. Hymers would like to hear from you. WHEN YOU WRITE TO DR. HYMERS YOU MUST TELL HIM WHAT COUNTRY YOU ARE WRITING FROM OR HE CANNOT ANSWER YOUR E-MAIL. If these sermons bless you send an e-mail to Dr. Hymers and tell him, but always include what country you are writing from. Dr. Hymers’ e-mail is at rlhymersjr@sbcglobal.net (click here). You can write to Dr. Hymers in any language, but write in English if you can. If you want to write to Dr. Hymers by postal mail, his address is P.O. Box 15308, Los Angeles, CA 90015. You may telephone him at (818)352-0452. Scripture Read Before the Sermon by Mr. Abel Prudhomme: Luke 22:39-44. “Blessed Redeemer” (by Avis Burgeson Christiansen, 1895-1985). I. First, Jesus weeps over the city, Matthew 21:9; Luke 19:41. II. Second, Jesus weeps in sympathy, John 11:11, 14, 33, 35.